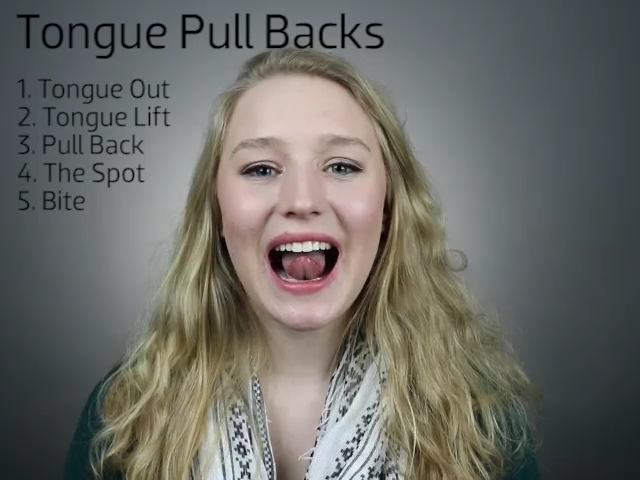 Pull Back: Slowly pull your tongue back into your mouth – keeping it skinny as you pull it back. 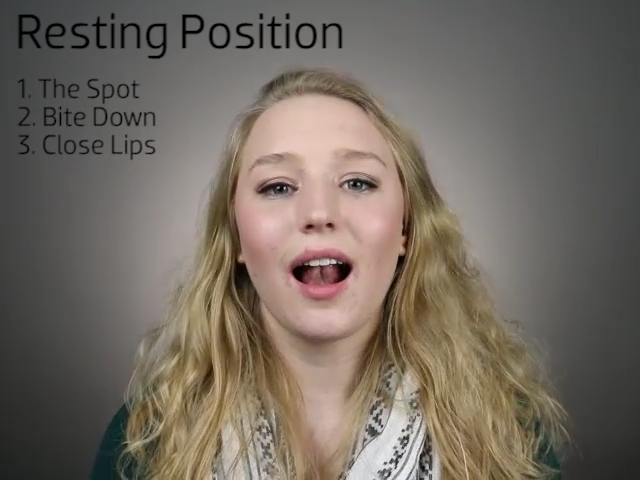 The Spot: After you have pulled your tongue into your mouth, lift the tip of your tongue up to “the spot” (the bumpy spot behind your top front teeth). 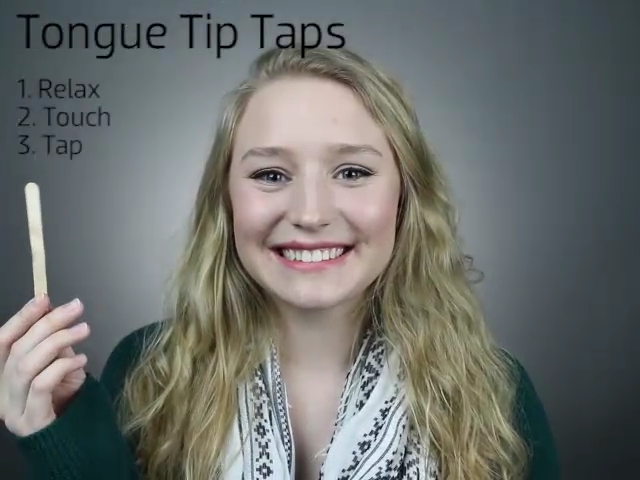 Bite: Slowly bite down your back teeth – keeping your tongue tip on “the spot” and your tongue narrow as you bite. As you complete the pull back – make sure your tongue is being pulled straight back using the back muscles in your tongue – don’t just curl the tip back to bring your tongue into your mouth. 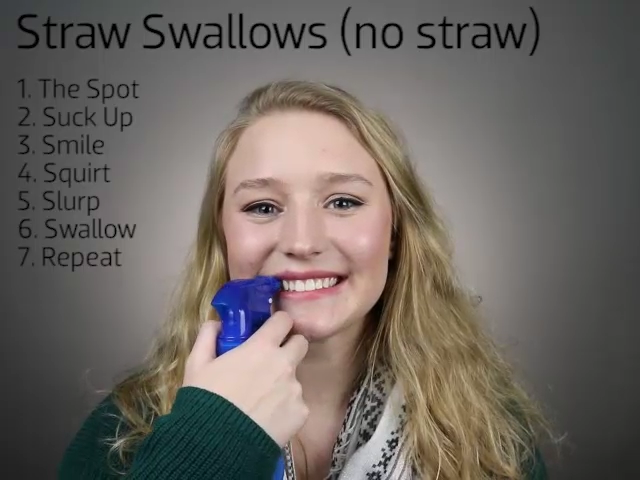 Straw: Place a straw horizontally directly behind your top front teeth and bite down. Do not let your tongue touch any part of the straw. Smile: Spread your lips into a wide smile and hold them there for the remainder of the exercise (even during the swallow). Squirt: Using a squirt bottle, spray a few squirts of water into both corners of your mouth. Swallow: Swallow the water keeping your tongue tip on “the spot”, the rest of your tongue against the roof of your mouth, and your lips spread wide in a smile. Repeat: Repeat these steps 5 times with the straw, 5 times without the straw, and then 5 times again with the straw. While swallowing your tongue should not push against the straw or your teeth. Your tongue should not push forward at all. Once you begin the swallow repetitions make sure to keep your mouth in a smile the entire time. Closing your lips between repetitions can result in quick and thrusted swallows that will end up ultimately un-doing all the work you have completed toward a new correct swallow pattern. Click here to open Worksheet #3.